HE PSALMS ARE AN endlessly rich source of spiritual nourishment. Whether it is the liturgy of the hours or the mass, the Psalms—some of the most ancient of scripture—are a central focus of our prayer. But for many who attend mass regularly, this is a head scratcher. 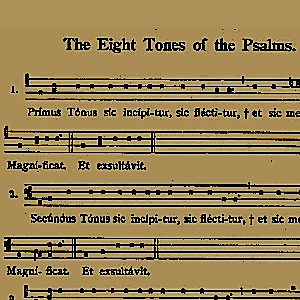 Often “The Psalm” only refers to the Responsorial Psalm. And that’s it. No more psalms sung in the mass. Furthermore, only a few short verses appear in the Responsorial Psalm. This is intentional, of course, as it is a direct reflection or “response” to the previous reading. However, if we do not sing the antiphons proper to the day—and the corresponding psalm verses—this may be all we get. AM VERY FORTUNATE to have a number of choir members with training in theology, some with advanced degrees. We have lively discussions, and I am often the beneficiary of their insights. Each year on Palm Sunday we rehear the striking words “My God, My God, why have you abandoned me?” I would propose for reflection that the many iterations of reflections on this one verse have trapped us into thinking a quite narrow and certain way. A case in point: if we say the word “prodigal,” we immediately add the word “son.” However, the father is much more lavish and generous in a substantial way than the younger son’s wild spending. The real point in the use of the psalm comes from an understanding of how those who heard it said would have understood. Jesus was preaching from the cross. He was using the words his Father spoke through him [THE WORD] to proclaim his mission to the last breath. The psalms are among the earliest scripture. By and large they were handed over orally. If a person heard the first words of a PSALM it would trigger the recollection of the whole psalm. So, the verses of Ps 22 on Palm Sunday lead us to the verses used here [Easter 5B] as well and those of today looking back to Palm Sunday—certainly much more than a lament and how “abandoned” Jesus felt. We are not abandoned, we are saved. The final words of Psalm 22 are not well known: Psalm 22:32. “The generation to come will be told of the Lord, that they may proclaim to a people yet unborn the deliverance you have brought.” Jesus’ message from the cross was ultimately that of redemption. This is what the psalms teach us. Jesus taught through the psalms. Sing the Mass. Sing the Psalms!